Although difficult, it is possible to get your staff on board with a change. A recent study published in Nursing Open shares how a group of nurse managers successfully changed aspects of their wards. A four-step process emerged from their stories. Echoing the principles of emotional intelligence, the four steps included (1) identifying, (2) prioritizing, (3) implementing, and (4) evaluating. These steps can be used to spearhead changes in your department. Although it’s tempting to make changes immediately, nurse managers who successfully implemented changes in their wards paused to explore the problems they faced from multiple angles. Doing your due diligence now will help you build a more compelling case for change later. Nurse managers who successfully made changes to their departments focused on one problem at a time and avoided overwhelming their staff. Ask colleagues and influential staff for their input on solutions. Involving key stakeholders at this point will help you gain the buy-in of your staff and superiors, which is essential. It can be frustrating to have a staff that resists your ideas. Still, you must demonstrate empathy for your team when you ask for change. Those nurse managers that were successful with change let their staff know how much they appreciated their time, effort, and knowledge. The nurse manager’s job is different from that of the nurse. The nurse managers interviewed in the study understood that this difference would create tension. It’s arguable that they weathered this tension better because they expected it and believed it was the natural byproduct of having a different role. Focus on performing your role as a nurse manager but remember to be a gracious leader. Even if you disagree with your staff, make sure they know you appreciate their time, effort, and skill. Monitor your progress. 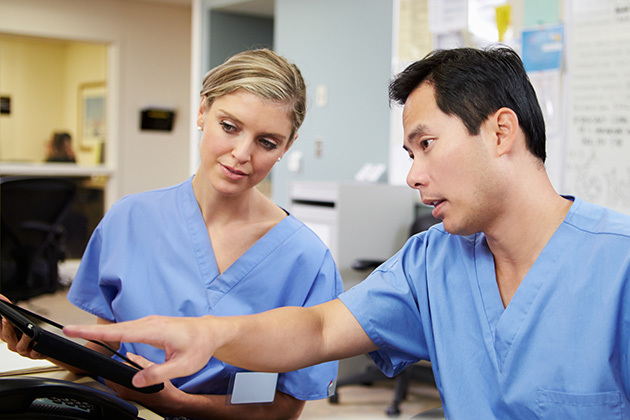 Although you’ll lead this step, you can develop a stronger relationship with your nurses by asking for their feedback. Nurse managers who executed their vision successfully assessed outcomes. Change takes time, and sometimes, revision. If something isn’t working, brainstorm solutions with your staff. Failure doesn’t reflect your leadership unless you insist on sticking to something that clearly isn’t working for you or your team. Troubleshoot your process if you’re struggling to lead your staff through change. If your process is sound, it may be time to explore how you lead. Before taking any additional action with a change that’s not working, consider whether you skipped a step in the aforementioned process for change. Did you act without appropriately researching the problem (step 1)? There may be a missing piece of the puzzle that needs to be addressed. Is there an easier way to solve the problem (step 2)? Get a second opinion from your colleagues and veteran staff. Were you cavalier with the emotions of your staff (step 3)? Thank your staff for what they do offer so they know they’re valued. Have you differentiated what’s working from what’s not (step 4)? Is there a small tweak you could make that would complete your solution? Ask your nurses. Reflecting on your leadership abilities requires a willingness to grow as a professional. Those who consider how they could improve as a leader usually develop better relationships with their staff which makes it easier for them to implement change. Are you pausing to think before you act? If you’re not in control of your emotions, especially your negative emotions, it will be difficult to lead. Are you being assertive or reactive? Reacting is the opposite of leading. You need to set the tone for your department and lead by example. What has your demeanor been like lately? Is your stress sending negative vibes to your staff? If so, you’ll want to change that. Stand tall, smile, move with purpose, and present a relaxed, but not a totally carefree version of yourself. If this is difficult, consider seeking help to set professional boundaries. Follow the emotionally intelligent process for change outlined by the current study. If you’re still struggling to implement a change after following these steps, consider what you may have missed and look to improve your leadership skills. The study interviewed 23 nurse managers and 17 nurses. Participants were mostly female and were between 30 and 70 years old. Management experience ranged from one year to multiple decades. Some participants’ employers offered training programs. Participants worked in med-surge, long-term care, rehabilitation, ICU, and palliative care at facilities that ranged in size from 100 to 800 beds.